The city is huge. It occupies over 9 milion people and covers 1,5 thousand square kilometers! It is about three Warsaws in terms of area or five in terms of number of people. The city is located at 2250m asl - it can be important for acclimatisation. The quickest and easiest way to move around the city is metro. One trip costs 5 peso, it is about 0,35$. They have 12 active underground lines! Mexico City is a maze of multi-lane roads. 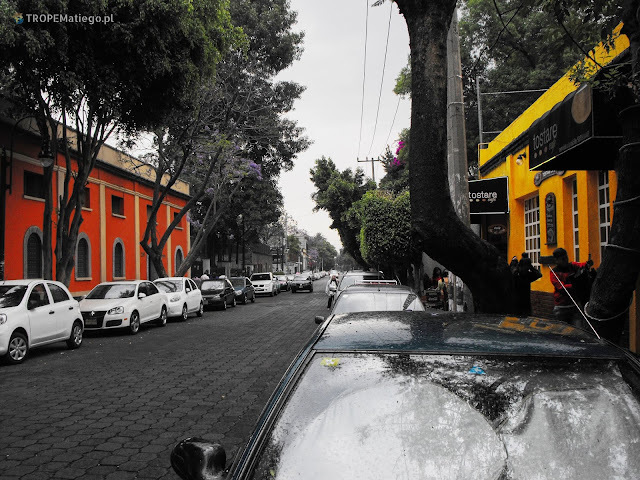 In Poland we don't have such wide highways as standard streets in Mexico City. Nevertheless traffic is big, even at night. I had the opportunity to travel by car driven by former rally driver. No one was able to overtake us. Even with that speed driving from one place to another took plenty of time. It is therefore worth to use subway. You also can take a metro-bus. It is a special, fast buse with their own lane on the roads. I heart they are also pretty fast. A little advice for drivers. Perhaps The Highway Code exists, but it is difficult to state that ;-). The cars are in different conditions. I could see cars without headlights. They don't have annual technical inspecion of the vehicle required by law. Only in Mexico City and probably somewhere else goverment examines emissions. They don't use hand brake when parking. It is possible to be blocked by other cars at the parking (especially at estate). In that situation you need to push other cars. So, your car may be parked few dozen meters away from the place it was left. It is woth to write a little more about this public transport. We only need the ticket to go throught the gates. Then we don't need it and we don't have it as the ticket gates don't return the tickets. So, implicitly, all those who are on the other side are legally there :-). At rush hours subway is very, very crowded. Police directs traffic underground. They allow people to move forward sector by sector. People in one sector are separated from other one. At this time women and children have separate sectors. Men are not allowed to get into such sectors, because their hands like to touch women. Entry to the train is quite interesting. First, there is fight to get out from the train, secondly there is fight to get into to this train. To get into took me three trains. And of course - pickpockets. Mandatory backpack on the belly. New food, different bacterials. I recommend to avoid street food, it is saver to go to restaurant, where you can be sure that the food (vegetables) are washed before serving. In a word, you nned to be ready for Moctezuma's revenge, especially if you add alcohol and / or chocolate with something sepcial to the list ;-). I had new smartphone. 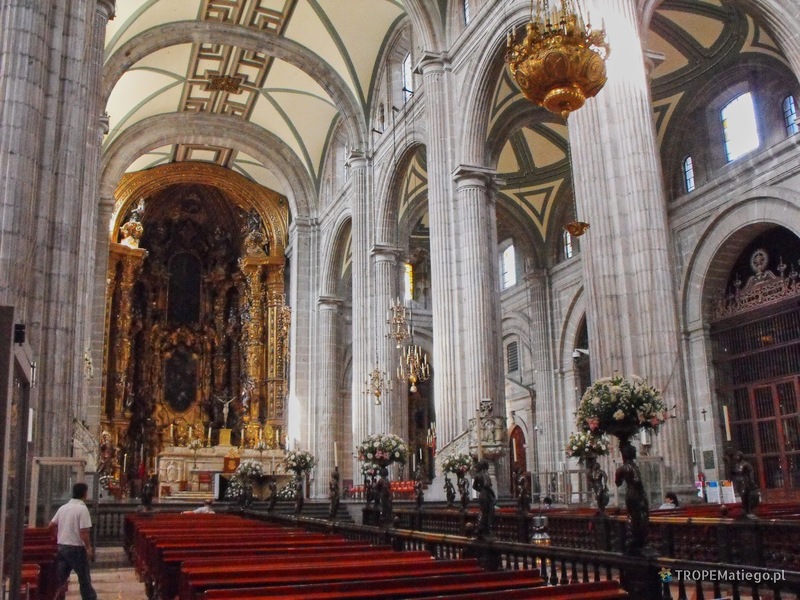 In Mexico I was able to have contact with Poland, but I couldn't call any Mexican phone number. I tried using many standards, with "+" at the beginning, with double zero, etc. Nothing worked. It would be helpful to figure out how it works before going to that country. Without any problem you can buy Mexican number. I bought one at bus station in Mexico City. Mexicans love direct sale, bargaining. I think that is something more, correlated with their traditions from the ancient times. Therefore, it is so difficult to find any supermarket. I found one close to subway station at Coyocan district. 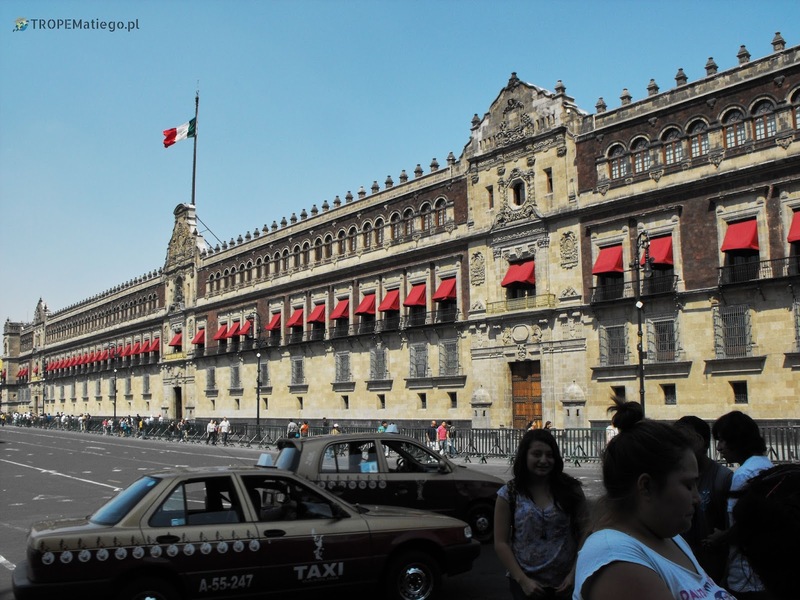 Mexican people prefer to shop at bazaars. Tasty dinner you can eat in not expensive place. It is important not to be attracted to the touts of expensive restaurants. It is worth to go to city center. 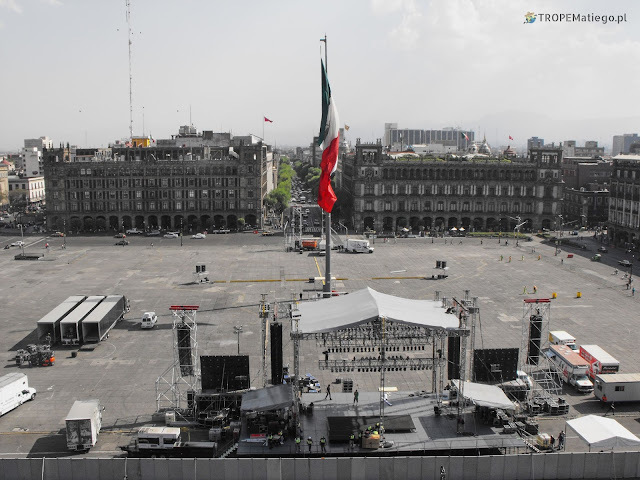 Zócalo is a huge market square with great Mexican flag standing on its center. 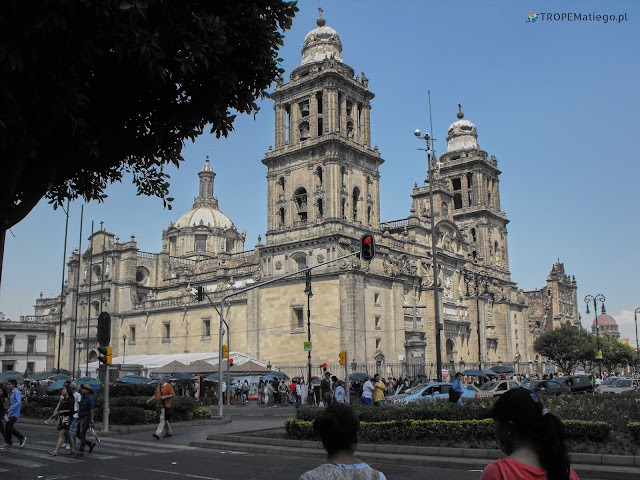 There is also majestic Metropolitan Cathedral, the Presidential Palace and Palac of Fine Arts is nearby. Other districts are also very interesting, like previously mentioned Coyocan district. 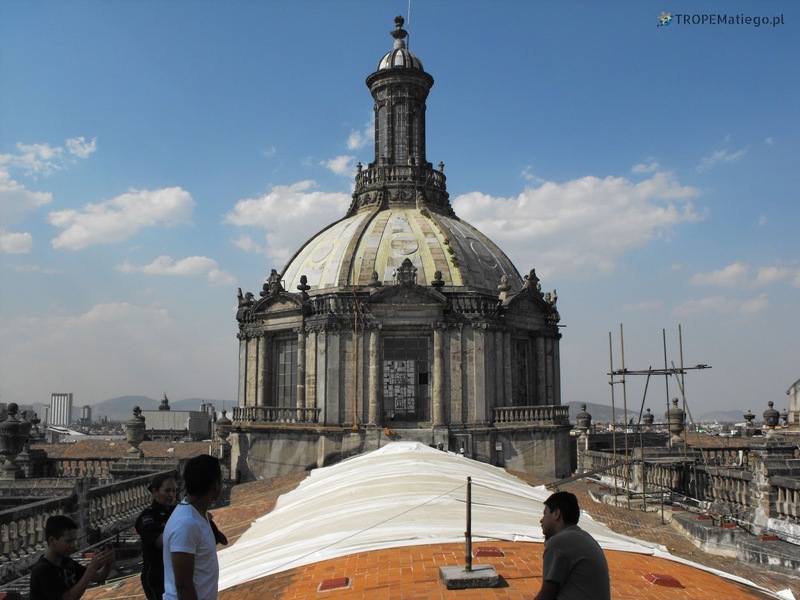 It is possible to go to the Cathedral's roof. 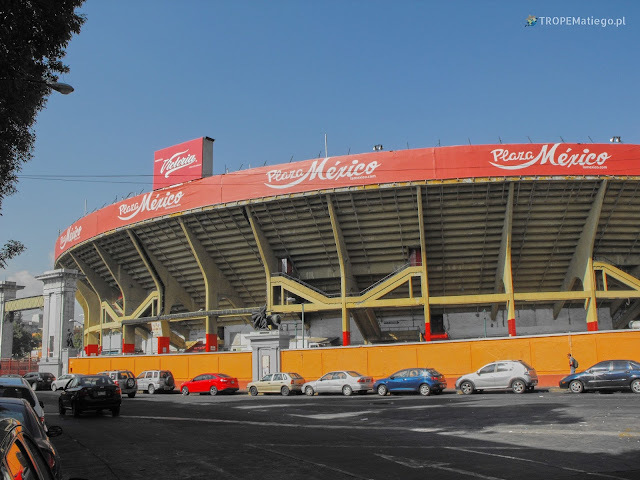 The ticket costs 20 pesos. The guide will lead the group of tourists to the bell tower and then to the roof. Be carefull of sellers who wants to sell the ticket for a higher price than it is fixed. Coyocan Park can not be reached with shopping. There are guards watching the comming people. Around the Zócalo are touts of expensive restaurants. It is better to go a bit further and eat dinner for reasonable price.